Q. When did you first beginning playing tennis? A. In August 2011. Soon after starting, I was sidelined with Achilles tendonitis for almost a year. Q. Who introduced you to the game? A. My Mom! I grew up watching tennis and always wanted to play but other sports like soccer, track and field took precedent. As an adult, I wanted to pick up a sport and tennis seemed like the most natural thing to do. Q.You are a promoter of the "Tuesday Night Tennis" at the Atkinson Stern Tennis Center on South Saratoga Street in uptown New Orleans. Would you please share with us the history of this program? Yes, I am a promoter. Randy Allen, the pro at ASTC started the program about two years before I came on to the scene. Randy Allen had invited a friend and myself to Tuesday Tennis; there were only four of us that played, (Randy included) and with only paying $5 to play, that seemed like the deal of the century! Afterwards, we chatted about the Tuesday Night Tennis, and Randy said he would love to have more people come out and play! That was all he needed to say. I told him we would have more people on the court next week! I made phone calls and at every tennis event I went to, I mentioned about ASTC Tuesday Night Tennis, inviting everyone to participate. Over the next few weeks we had 2-3 courts filled and once I started playing USTA league, I encouraged all my teammates to come out and join us. Over the past three years, our Friends of Atkinson-Stern Booster club have become more involved with planning, prep work, and cleanup. With sometimes having up to 30 players, Tuesday Night Tennis isn't a one person job, but more of a team effort. Q. Do you play USTA League Tennis? I play USTA League, a Wednesday Night REC League out of TerryTown, and TNT Ladies league. Q. What do you enjoy most about playing tennis? I love how the game is a constant challenge, always having to push myself to make a better shot choice or stroke the ball more technically. I enjoy the competition of all play, league or fun, but most of all, the social aspect takes the cake! Getting to meet new people has led to many great experiences and some lovely friendships, even a few mentors. Q. In your view, what is the "most positive thing" that the New Orleans area tennis community is presently doing? A. The Tennis Apprentice program is simply awesome! Starting an adult sport can be very intimidating...I remember. Biggest question is where do you start? For me, I went to Second Serve, and told the owners I wanted to play tennis, so what do I need and where would I go? I walked out with my gear and directions to City Park Pepsi Tennis Center. As luck would have it, I met Sundance (a pro) who was able to give me a lesson, and I soon joined playing with his doubles group on Saturdays and Sundays. I had it easy but for someone who is shy, the Tennis Apprentice program is wonderful. It's an inexpensive way to learn the basic fundamentals of the sport, and to meet other new tennis players. There seems to be many more 2.5s and 3.0s joining the sport, and I think that's due to the success of this program. Q. If you could suggest one thing that would promote tennis--get more persons playing tennis--what would it be? Your Newsletter! One of the hardest part about trying to play more tennis is not knowing what activities are being held when, or where. 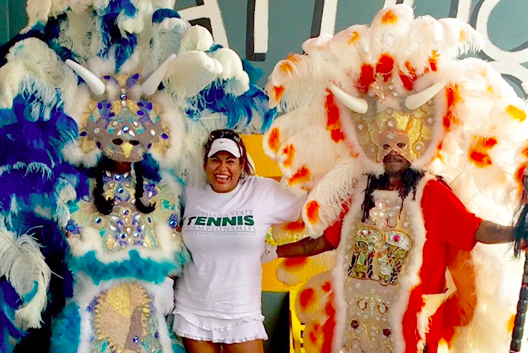 The newsletter informs us about the tennis events throughout our New Orleans along with different perspectives of the game, and promotes ways to stay a healthy tennis player.